Traditional music has always featured in classical works, from ballad opera’s popular songs to the Croatian tunes in Haydn’s string quartets. But it was from the 19th century onwards that opera composers developed a particular interest in national and folk music, using it both to explore other cultures and to celebrate their own countries’ traditions. For the 19th-century Russian composers known as the ‘Mighty Handful’, traditional music was a vital part of the new style of opera they planned to create, celebrating their country’s history and folklore. Musorgsky expresses the Russian people’s loyalty through the popular folksong ‘Slava Bogu’ in Boris Godunov’s Coronation Scene. In Prince Igor, Borodin quotes a vast array of Russian folk tunes; he also consulted a Hungarian traveller on how to make the opera’s Polovtsian scenes sound appropriately ‘Eastern’. Rimsky-Korsakov meanwhile collected more than a hundred Russian folksongs, mastering their style so well that the original ones he wrote for his operas were sometimes mistaken for authentic traditional songs. Nineteenth-century German composers also explored their country’s popular musical traditions. Wagner’s Die Meistersinger von Nürnberg does not contain any authentic German folk music, but numbers such as Hans Sachs’s Act II Cobbling Song and Act III’s chorale (to a text by the real Sachs) pay tribute respectively to German folksong and Lutheran chorales. Wagner went still further in Parsifal, where the traditional ‘Dresden Amen’ is of major musical and dramatic importance. Traditional German culture meant much to him, as it did to his one-time assistant Humperdinck, who celebrated German popular song in his original folksongs for Hänsel und Gretel. In Carmen, Bizet uses traditional music to a different end – not to celebrate his own culture, but to depict a mysterious foreign one, associated almost entirely with the gypsy heroine. Carmen’s opening Habanera (based on a popular 19th-century Spanish song that Bizet wrongly believed to be a folk tune), vibrant Seguidilla and exuberant ‘Danse Bohémienne’ use melodies spiced with chromatic twists and lively Spanish dance rhythms to characterize her as sensual, exotic – and very different from the other characters, who sing in a more conventional operatic style. Puccini went further in Madama Butterfly, using traditional Japanese music – ten songs in all, sourced from a book of Japanese folk music – to depict not only his vulnerable heroine but also her environment. However, his main focus is always on Butterfly, and the conflict between East and West embodied in her ‘marriage’ to Pinkerton. He highlights the couple’s differences from their first appearances: while Pinkerton enters with a forthright, ‘Western’-sounding aria that includes a quote from ‘The Star-Spangled Banner’, Butterfly arrives to a delicate setting of the Japanese folksong ‘The Lion of Echigo Province’. As the opera progresses and Butterfly’s situation worsens Japanese music increasingly dominates the score, culminating in Act III’s ritual suicide. 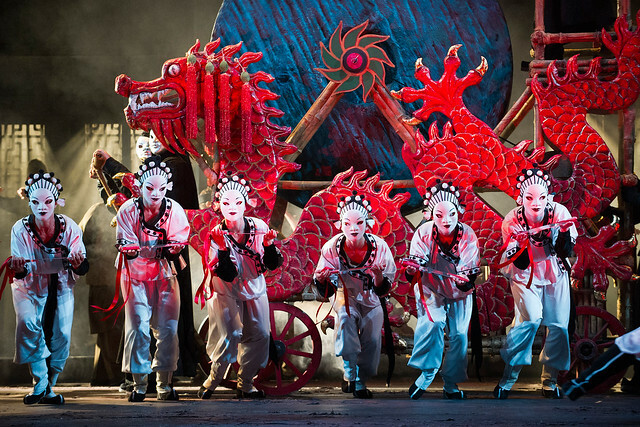 Puccini returned to Eastern traditional music some twenty years later with Turandot, sourcing Chinese music from a musical box and a book of traditional songs. In this opera, however, national music is used to create an exotic fairytale ambience rather than depict a personal tragedy. It is also primarily associated with ritual: Turandot arrives in Act I to the Chinese folksong ‘Mo Li Hua’ (Jasmine Flower), while Emperor Altoum makes a grand entrance in Act II to the Ancient Imperial Hymn. The opera composer perhaps most associated with traditional and folk music is Janáček. A dedicated folklorist, he used his studies of the traditional music of Moravia (now the Czech Republic) to create original versions of Moravian folk music for operas such as Jenůfa with its dances and wedding songs, and The Cunning Little Vixen with its rustic animal rituals. Nor did he limit himself to his native country’s music. His two ‘Russian’ operas draw movingly on traditional Slavic music, from the playfully amorous folksongs of the young lovers Varvara and Kudrjáš in Kát’a Kabanová to the exquisite orchestral folksongs expressing the prisoners’ nostalgia for their past lives and the outside world in From the House of the Dead. Janáček’s wonderful operas show what a rich source of operatic inspiration folk music can be, both in the depiction of individual characters and in the creation of vivid environments. Die Meistersinger von Nürnberg runs 11–31 March 2017. Tickets are still available. The production will be broadcast live to cinemas around the world on 30 March 2017. Find your nearest cinema. The production is a co-production with Gran Teatre del Liceu, Barcelona, and is given with generous philanthropic support from Mrs Susan A. Olde OBE, Spindrift Al Swaidi, Mrs Philip Kan and the Maestro's Circle. Turandot runs 5–16 July 2017. Tickets go on general sale 28 March 2017.